In any sport you play you are always looking for the edge, right? You want to be the biggest, or the strongest, or the fastest. Well, in swimming it’s no different. They train long hours in the pool and gym to become the best and fastest swimmer they can be. Well, if you are looking for an edge, maybe this will help you out and make a difference. In the morning, or before you go swimming, you are going to want to eat some breakfast. Timing is almost as important as what you eat. Be sure to eat about 2 hours before you go swimming to allow the food to digest. This is important because you want your body helping your muscles, not digesting your food. Make sure that you eat something with some fiber like an apple or some oatmeal as well as some protein like almond butter on toast. The protein will give you long energy, the bread will burn quick and the fiber will make it last longer. Eating this kind of combo can really make a difference in how long and how well your swim goes. I know when I’m hungry, the swim is over. Food is king! If you are doing a lot of swimming, you should bring something to eat and drink. Or you can bring your new best friend, the cantaloupe! This often over looked melon is full of restorative vitamins. Since it is mostly water, it will help with hydration and give you a little fiber to keep the energy burning. So, use this secret weapon and power up for a few more laps! Once you get home, make sure that you are giving your body some stuff to work with to help you build back up the muscles you have broken down. You will need both protein and carbohydrates if you don’t want to be a giant mass of pain the next day. So, make some combos like avocado, chicken pasta or burritos and rice. The big key is to make sure you eat within a hour of your workout or else the massive pain thing may become a reality for you, my friend. Whatever you choose to do for food, be sure to stay away from fast food. It will only make you slower. 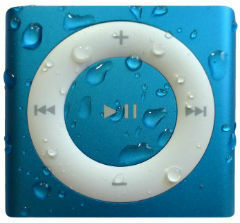 Also, be sure to pick up a Waterproof iPod Shuffle from Underwater Audio. Because if food won’t make you go faster, then rocking out to music while you swim sure will! As always, if you have any comments please leave them in the section below. Swim fast and have fun! Sign up for our newsletter for 10% off your first order!